The Flower Carved Chaise Longue - Antique Silver & Grey Damask. 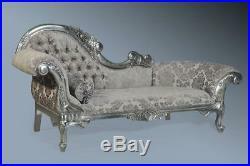 The Flower Carved Chaise Longue: Antique Silver & Grey Damask. Length- 200cm Depth-67cm Height- 102cm. Our quality Flower Carved Chaise Longue has been hand crafted out of kiln dried, mahogany. This statement piece oozes grandeur and opulence that would make a lavish statement in any room. The elaborate Chaise Longue has very intricate carvings of Acanthus leaves, scrolls and flowers throughout the frame, that makes this classical piece timelessly beautiful. Lavishly hand gilded in the ultimately luxurious finish of silver leaf. The silver leaf has had an antiqued aging process to the leaf to achieve that old, subtle, antique look. The grand Chaise has been beautifully upholstered in a grey, velvet cut damask complimented with silver upholstery studs to add that quality finishing touch. These subtle colours really do make this chaise elegantly beautiful. Solid Mahogany - Wooden Frame. Beautifully hand finished in a quality antique silver leaf. Comes with a beautiful tassel cushion. Comes In Left & Right Hand High. Available in other sizes and finishes. Silver Leaf & Black Velvet. At Chateau we take pride in giving the customer what they want. Our courier will carry the item to your desired location, however please note that this is a'one man' service, so he may require additional assistance, if the item is heavy and/or large. Please check all items carefully before signing for them, if there are any problems then notify the courier and they will take the item back with them. If you decide to return the item at a later time for any reason, you will have to arrange for collection at your own expense. You're welcome to collect your item, however please notify us beforehand so we can get your item ready for dispatch. All goods must be inspected on arrival and then signed for. Any damaged items must be signed for as damaged and taken back with the courier to avoid any unnecessary collection charges. If you do fail to send the item(s) back with the courier you will incur a collection charge. We stock a whole selection of our high quality reproduction furniture and mirrors. Our warehouse is open 5 Days a week. Monday - Friday 10.00am - 5.00pm Please call beforehand to make sure someone will be at the warehouse if you plan on coming to visit. The item "Large Antique Silver Pewter Chaise Longue Grey French Ornate Lounge Day Bed Sofa" is in sale since Friday, February 8, 2019. This item is in the category "Home, Furniture & DIY\Furniture\Sofas, Armchairs & Suites\Chaises Longues". The seller is "chateau_luxury_furniture" and is located in Chester. This item can be shipped to United Kingdom, Ireland.